Glen Arden second graders celebrated the first day of spring with a visit from Chef Adam Hayes of the Red Stag Grill. The students had already made their own fresh queso blanco to fill the raviolis, so the day was spent rolling out the dough (packed with fresh, local kale!) and handcrafting each individual ravioli. After passing the dough through the pasta maker, students cut out two matching shapes using cookie cutters, added a small amount of queso blanco, and sealed the two sides together to make a complete ravioli. They brought their finished creations to Chef Adam who added them to a pot of boiling water where they simmered their way to pillowey perfection! The verdict? Nearly all of the students loved the raviolis and can’t wait for Chef Adam to join them for their next cooking adventure. 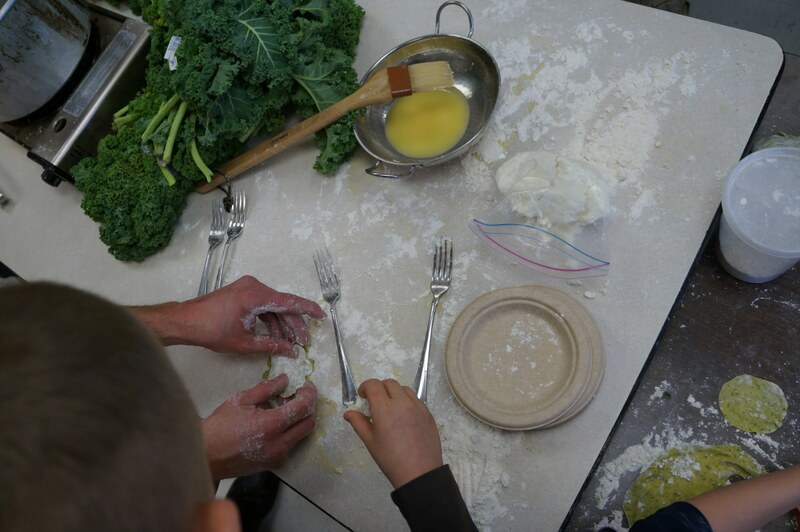 Want to make your own kale ravioli at home or in your classroom? Check out Chef Adam’s recipe and let us know how it goes! Farm to School activities in Southern Appalachia.